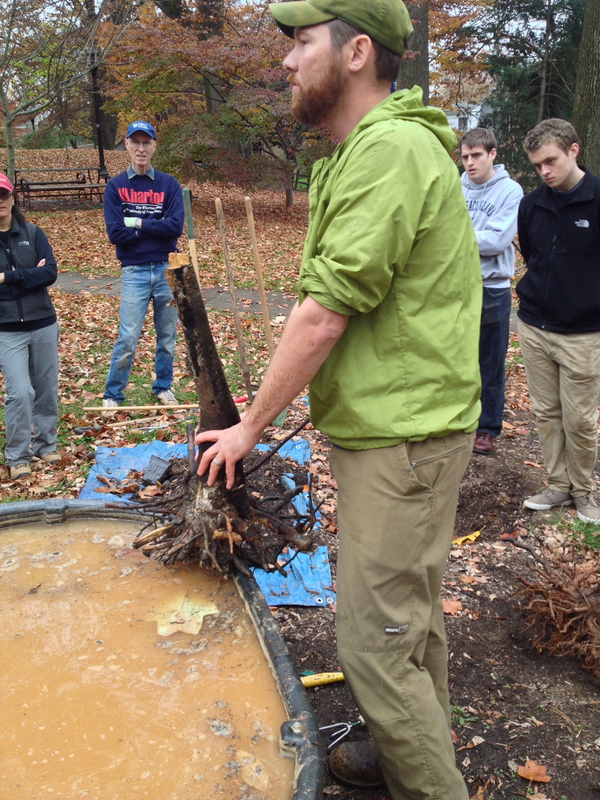 Falls Church Arborist Ben Thompson explains tree root physiology. On Sunday, Nov. 17 City of Falls Church Arborist Ben Thompson demonstrated at Frady Park how to wash the roots of a tree before planting. It is a relatively new technique that is taking the tree world by storm. The advantages of this technique is that trees are more likely to be planted correctly without girdling roots from containerized trees or without the wire cage and burlap removed from B&B planted trees. The aim of root washing is to expose the interior of the root ball. Once the soil has been removed — by submerging the root ball in water or by hosing away the soil — “J”-shaped roots and girdling roots can be cut out and fibrous root strands can be arranged to best advantage for the tree. 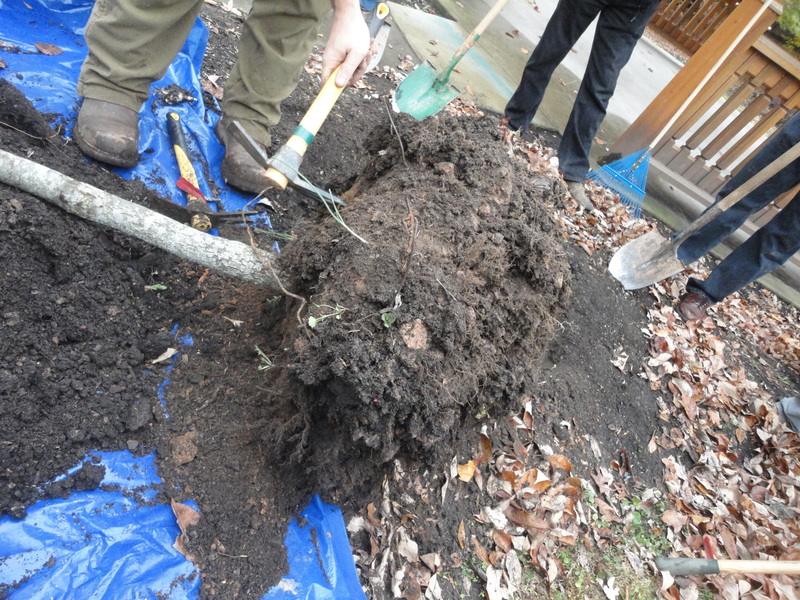 Root washing may also reveal the tree’s root flare, which should be above grade. Oftentimes in nurseries soil is piled up above the flare, sold and then planted in the landscape without correction. This leads the underground bark to become wet and soggy, a perfect entryway for diseases and pests, and curtails the life of the plant. Flare is the section of the tree where the trunk turns into the root system. It’s wider sloping body should be visible. What happens to trees incorrectly planted? This sourwood tree was planted three years ago but failed to thrive so it was excavated as a learning for volunteer tree planters. Surprise! The wire cage and burlap is still visible – a poor planting job confined this tree to the nutrients only in its rootball. Wires and burlap were removed, roots were soaked for 36 hours before the being pulled apart, each root straightened and then carefully replanted using the bare root method. Now that it has been freed and correctly replanted, will it thrive? Check back next year when we update the post. Note the wire cage and burlap still visible after 3 years. Poor planting. 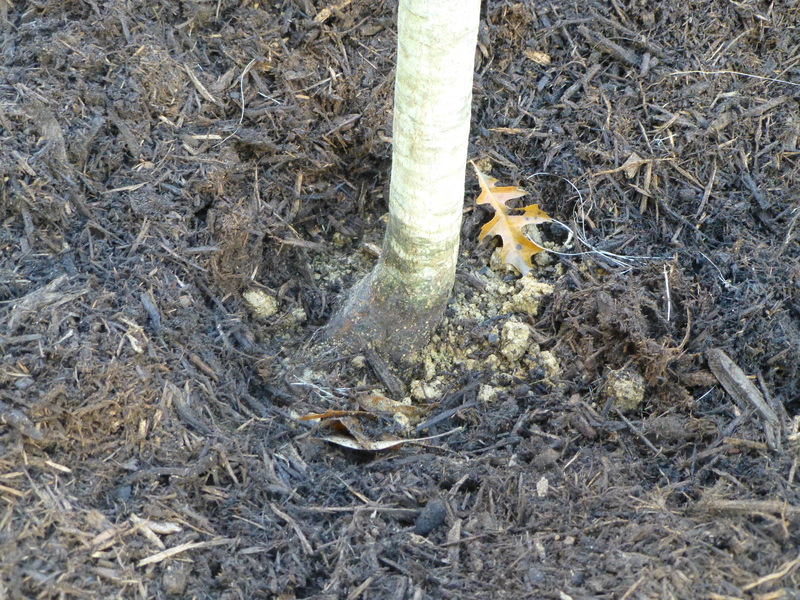 This entry was posted in Education, Tree Care and tagged bareroot planting, root washing. Bookmark the permalink.